The toilet paper holder is probably one of the most overlooked bathroom accessories out there, but interior designers are always looking for innovative ways to help a room stand out. Care2.com recently featured a few ingenious designs that could be a welcome change for your washroom. For those going for a rustic aesthetic, Live Wire Farm offers branch hooks that are fashioned from a piece of tree branch. The upright holder could be a wonderful addition for those seeking a natural color scheme. On the green front, Green Grass Design offers a holder made from a wire coat hanger. All of these items do the job, but they have a unique panache that adds character to a bathroom. 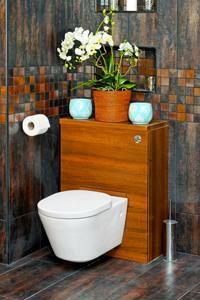 Lastly, Spotted to Desire offers a wall-mounted crate to hold multiple toilet rolls above a toilet. While this is ideal for someone going for a scheme with re-purposed materials, attractive shelving and other cabinets could also do the job. While these additions will certainly lend to the overall theme of the space, those going for a traditional design can use stainless steel, copper or black pieces on the side of a bathroom vanity to create a streamlined look. Toilet paper holders are great accessories in bathroom.